Save valuable time using the Clone feature to duplicate existing reactions. Go to the Studio and choose Reactions. Scroll to the reaction you want to duplicate and click Clone. 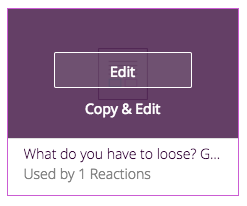 Immediately after the Cloned Reaction opens, you will land in “Choose a Reaction Type” settings. Leave as is if you want to duplicate the same Reaction type. 2. (Optional) If the Reaction will be on a different page, click on the URL path and enter the new page, then click Continue. Select Next to move on to the Content Card step. 3. If you want to update the content from the existing reaction, click "Copy & Edit" to update the existing content in a new card. Make your updates, name and save your new card. Select Next to move onto the Select Triggers tab. 4. Keep the same trigger or select a new trigger. Double check that the page filters, if used (under “Affect all pages”) are still applicable or update as necessary. Select Next to move onto the Personas tab. 5. Reuse the existing Persona, assign a new Persona, or choose to skip this step based on your needs. 6. Finally update the name of your new Reaction and save! That's all it takes to save time by copying from existing reactions. Note: If you're cloning your reaction for an A/B test, be sure to enable "A/B Test" option for all variants. We recommend testing only one variable (e.g. reaction type, content or trigger) at a time between variants for the best learnings.